Mounts to the stairs, not the wall - Seat swivels 90º at both the top and bottom of the stairs. Seat and footrest fold up when not in use. Seat and footrest fold up when not in use. - Can be used in or outdoors! 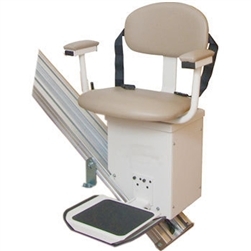 We now offer a wide range of Stair Lifts to suit individuals with a variety of physical disabilities and handicaps. Whether you have stairs outdoors or indoors, these lifts will help you ascend with ease. A number of our products are ADA compliant and all of them are built to exceed your expectations where safety and quality are concerned. Call Wheelchair Authority at 1-866-218-0902 today!